David Anderson is senior director, automotive program, at Steel Market Development Institute, Washington, D.C.; 202/452-7100, www.smdisteel.org. As the automotive industry works to meet increasingly stringent fuel economy and safety regulations, the steel industry continues to collaborate with automakers to innovate and implement advanced high-strength steels (AHSS) into new vehicle designs. AHSS is the fastest growing material in automotive applications, according to a 2015 report by Ducker Worldwide, showing that the amount of AHSS used annually in automotive applications has totaled 10 percent higher than forecast during the past three years. A testament to the industry’s interest in AHSS, in particular third-generation AHSS (3rd-Gen AHSS), the United States Automotive Materials Partnership LLC (USAMP), a wholly owned subsidiary of the U.S. Council for Automotive Research LLC representing FCA US LLC, Ford Motor Co. and General Motors, completed a four-year project in 2017. This project worked to develop an Integrated Computational Materials Engineering (ICME) model for 3rd-Gen AHSS. Fig. 1—With more than 200 automotive-sheetmetal on the market and more on the way, material choices abound for various strength and lightweighting applications. Today, with more than 200 automotive-sheet-steel grades available (Fig. 1), automakers can fit the proper grades to specific applications. This results from collaborative efforts by steel and automotive industries to develop innovative material and manufacturing technologies. Compared to a decade ago, today’s steel grades offer as much as six times the strength. The added strength of AHSS allows automakers to deliver performance and safety benefits with lightweight products, using their existing manufacturing infrastructure and eliminating major manufacturing costs associated with the introduction of alternative materials. First-generation AHSS such as dual-phase (DP), ferritic-bainitic (FB), complex-phase (CP), martensitic (MS), transformation-induced-plasticity (TRIP) and hot-formed (HF). They offer significantly higher strengths as compared to conventional steels, and some also provide improved formability. Second-generation AHSS with mainly austenitic microstructures and include austenitic stainless steel and twinning-induced-plasticity (TWIP) steel. These strong and formable grades can be used to provide extraordinary mass reduction for difficult-to-form parts. Third-generation AHSS, now being introduced commercially. These grades mainly include multi-phased (MP) steels with high strength and increased formability as compared to first-generation AHSS. To bridge the properties gap between first- and second-generation AHSS, 3rd-Gen AHSS is being developed to provide a high-value steel solution to automakers. This new generation of steel shares the high-strength properties of AHSS along with a high total elongation similar to high-strength steels. This allows automakers to use their current stamping and assembly infrastructures. 3rd-Gen-AHSS applications in vehicles can include lightweighting through direct material substitution and thickness reduction; improved energy absorption through enhanced strength/ elongation; and optimized geometries and part consolidation enabled by enhanced formability. Potential applications identified for maximum performance and weight-reduction benefits include A and B pillars, roof rails, roof bows and underbody reinforcements to name a few. Fig. 2—The project team simulated 3rd-Gen AHSS into a baseline automotive side structure. Its design was optimized to take advantage of improved 3rd-Gen-AHSS mechanical properties, resulting in a final design that reduced the number of components from 46 to 28 and achieved 30-percent mass savings. The design, employing component thicknesses of only 0.5 to 2 mm, cost-effectively met vehicle-crash and stiffness requirements. Development of 3rd-Gen AHSS grew out of the Integrated Computational Materials Engineering (ICME) project, managed in collaboration with the Auto/Steel Partnership and funded in part by a competitively solicited $6 million award from the U.S. Department of Energy (DoE) in 2012. The project’s goal: create an ICME computer model to aid the steel industry in developing 3rd-Gen AHSS used in manufacturing lightweight steel components to meet automotive mass savings, performance and safety requirements. The project included support by five universities, three steel companies, two engineering firms, three automotive OEMs and one national laboratory. Because no commercial 3rd-Gen AHSS existed at the project’s onset, the team developed a microstructural model based on existing AHSS with properties similar to 3rd-Gen AHSS. 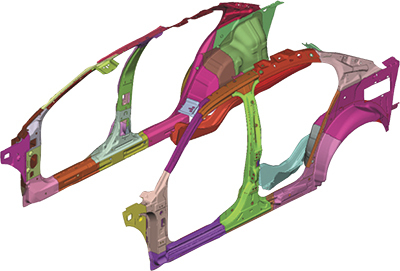 This ICME model extends the full breadth of component development, from atomistic modeling to microstructural modeling to vehicle/component modeling. To validate the model, the team produced small-volume heats of two 3rd-Gen-AHSS alloys with mechanical properties that met DOE targets for a high-strength, exceptional-ductility 3rd-Gen AHSS, and nearly met targets for exceptional strength and high ductility. The first, a medium manganese (10 percent by weight) 3rd-Gen-AHSS alloy, achieved 1200-MPa ultimate tensile strength and 37-percent tensile elongation, which met the DOE target for high strength and exceeded the 30-percent exceptional-ductility target. The second 3rd-Gen-AHSS alloy with 3-percent manganese achieved 1500-MPa tensile strength and 19-percent tensile elongation, which met the strength target and fell short of the 25-percent ductility target. With insufficient time to develop and produce an exceptional-strength, high-elongation steel meeting DOE targets for both strength and ductility, the project team employed the ICME material model to predict a steel microstructure that would do so. In addition, the project team designed and built a dieset to validate the forming model with respect to geometry and thickness, and material models with respect to post-forming microstructure and mechanical properties. Data obtained from the medium-manganese 3rd-Gen-AHSS T-components enabled the project team to better predict post-forming microstructure and subsequent mechanical properties. The project also simulated the application of 3rd-Gen AHSS into a baseline automotive side structure shown in Fig. 2. The side-structure design was optimized to take advantage of improved 3rd-Gen-AHSS mechanical properties, resulting in a final design that reduced the number of components from 46 to 28 and achieved 30-percent mass savings. This optimized design met vehicle-crash (pole intrusion, side impact, rear impact, roof crush) and stiffness (torsional and bending) requirements—significant considering that steel thicknesses for the side-structure components ranged from 0.5 to 2 mm. Even with such reduced thickness, the optimized final side-structure design showed improved crash performance versus the baseline design.